With the new Trueplay app anyone can tune their Sonos Play speakers like a pro acoustic engineer. Multiroom audio maestro, Sonos, has just released a refresh of its flagship Sonos Play:5 smart speaker. But not only that, it's also going to turn you into an instant acoustic engineer too. Sonos' new Trueplay application will allow you to tune any of its Sonos Play:1, Play:3 or Play:5 speaker systems at the touch of a button. That means no matter where you place your speakers in your home they will sound almost as good as they would if an audio specialist set them up for you. It works through an iOS app, the iPhone or iPad microphone and a single tone emitted from your Sonos speaker. The application measures how the sound from the speakers is reflected off the walls and the different materials around the room. It then tunes the speaker specifically to the acoustics of that particular room. At the moment Trueplay is only available on iOS devices as the mic calibration varies so much between different Android devices. Though Sonos is working on bringing its setup app to that platform in the future. 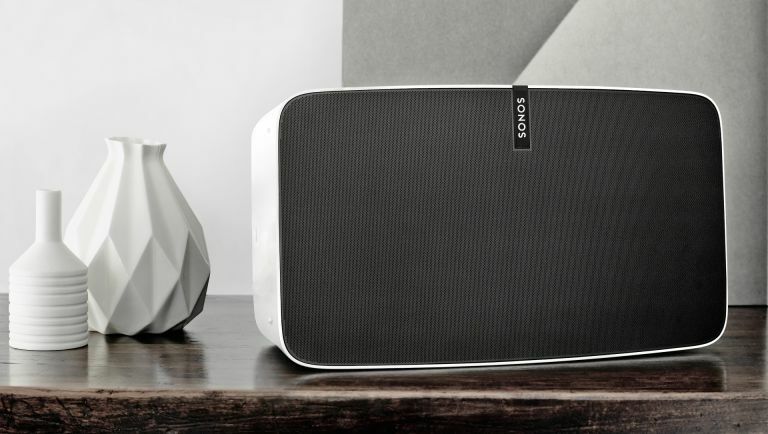 Taking advantage of your newfound acoustic expertise the new Sonos Play:5 has had its driver array redesigned to deliver the best sound possible from its new flagship speaker. The new Play:5 eschews the old version's twin tweeter, twin mid-range, single subwoofer driver array in favour of three crystal clear tweeters and three beefy mid-woofers beneath them. The new six-driver arrangement is partly responsible for the new orientations the Play:5 can be used in. On its own the traditional horizontal standalone method is best, but with a pair you can either set them horizontally to give a more room-filling soundstage. Or if you're listening on your own setting them up in a vertical pairing will deliver a more focused stereo effect with a defined, intense sweet spot. The new Sonos Play:5 speakers are available now for £429.